Blog post by Amy Jewel, City Advisor, City of Chicago. The City of Chicago recently published its first report on the Chicago Building Energy Use Benchmarking Ordinance, providing key findings from the first year of reporting under the ordinance. All commercial and municipal buildings more than 250,000 square feet in size were required to benchmark, verify, and report energy information to the city this past June. Almost 350 buildings complied, including more than 75 buildings that voluntarily provided energy use information or did so in advance of the deadline for their building sector or size. The overall compliance rate in 2014 was over 90 percent. To support reporting buildings, the City partnered with several supporting organizations to provide free resources such as trainings, online materials, and a benchmarking Help Center. Many building owners, managers, and their representatives took advantage of these resources; the Help Center had over 800 email and phone interactions, and 375 individual participants attended 16 free trainings. Chicago is also partnering with IMT and the Natural Resources Defense Council to advance energy efficiency programs and policies through the City Energy Project, a national initiative to improve the energy efficiency of buildings in 10 U.S. cities. The 2014 report offers an unprecedented view on energy use in some of Chicago’s largest buildings, and lays a foundation for future years of tracking and measuring building performance. Because the city is not authorized to provide building-specific information until the second year of reporting under the ordinance, Chicago’s first report focused on aggregated data. However, the report also highlighted five buildings that volunteered to share additional information about what they discovered through benchmarking their facilities. Out of approximately 350 reporting buildings, 254 buildings were included in the report’s analysis. (Buildings excluded from the analysis included 77 early and voluntary reporters and a few buildings identified as outliers, or missing key information.) In 2014, well over half of the 254 buildings analyzed were commercial offices, with 158 reporting buildings of that type. Additional building sectors represented included K-12 Schools (41 buildings); healthcare facilities (20 buildings); university / higher education facilities (14 buildings); and other types of buildings, such as stadiums, malls, and museums (21 buildings). While the report includes information and findings for each of these five building sectors, this post will focus on Chicago’s commercial office buildings. What did Chicago find in reporting office buildings in 2014? The median ENERGY STAR Score for Chicago’s offices over 250,000 square feet was 78 out of 100, which is similar to the median scores of office buildings of 250,000 square feet or greater in New York City (75), Philadelphia (77), and Washington, D.C. (81), based on publicly available information from these cities. (New York City, Philadelphia, and Washington, D.C. also have local benchmarking ordinances; see www.buildingrating.org for more information.) 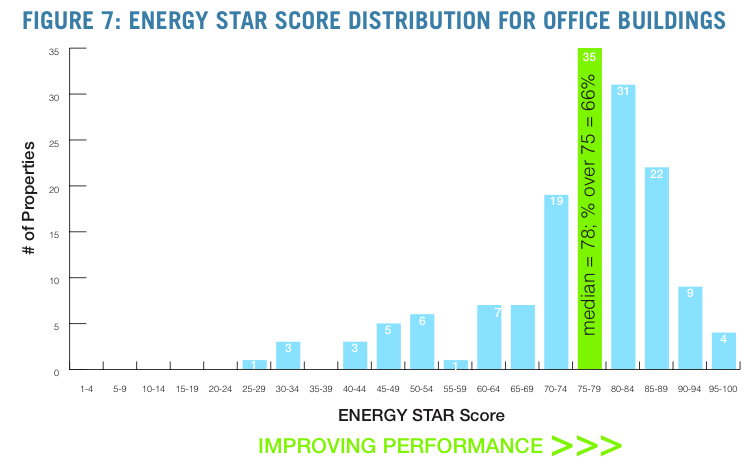 Also, 66 percent of reporting offices had an ENERGY STAR score of 75 or above. 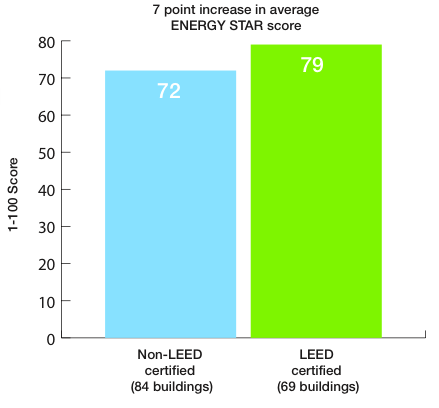 A median score of 78 suggests higher-than-average performance, and could be associated with many buildings’ efforts to earn certifications such as LEED and ENERGY STAR. Chicago consistently ranks among the top 10 U.S. cities for the number of these two building certifications, having been ranked third for LEED-certified projects in 2012 and sixth for ENERGY STAR-certified buildings in 2014. And in Chicago, LEED certification appears to be associated with improved energy performance. Out of the reporting office buildings with ENERGY STAR scores, 69 buildings (45 percent) were LEED certified. These 69 buildings achieved, on average, an ENERGY STAR Score 9 percent higher than buildings without LEED certification, equal to an increase in seven points. What energy savings are possible in Chicago’s large office buildings? An additional 34 office buildings in Chicago are nearly certifiable, having ENERGY STAR Scores from 60 to 74, and would only need an increase in their score of 15 points or less to reach the 75 points needed to be eligible for certification. 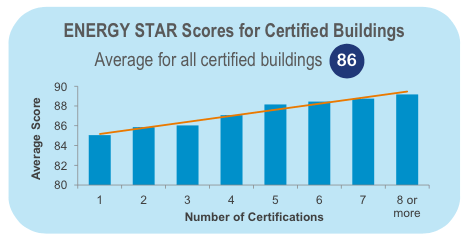 The same ENERGY STAR studymentioned above found that certified buildings with an initial score below 75 improved by 23 points and reduced energy use by a whopping 21 percent, on average, suggesting even greater savings are possible for these nearly certifiable buildings than the highest performers. What’s next for Chicago energy benchmarking? The next reporting deadline in Chicago is June 1, 2015, and all commercial and municipal buildings 50,000 to 250,000 square feet will be required to benchmark, verify, and report for the first time, along with all multifamily buildings over 250,000 square feet. Nonresidential buildings reporting in 2014 (250,000 square feet and greater) are required to benchmark and report by June 1, 2015, but are not required to verify information again until 2017. For more information on Chicago energy benchmarking, visit the City’s website at www.cityofchicago.org/energybenchmarking.